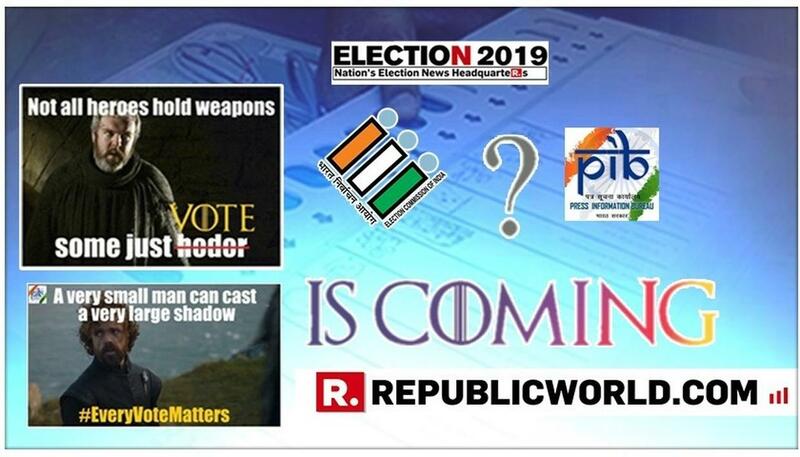 While the Election Commission and the Press Information Bureau have been upping their pop-culture quotient with some very well-received teases in their efforts to encourage a high voter turnout in the ongoing Lok Sabha polls, that endeavour has now reached a new peak. "? Is Coming" the EC said in its first tweet, in reference to the show's famous 'Winter Is Coming' warning which has finally now come true with the debut of Season 8. After our #VoterQuotient quiz for the scholarly followers, now we have something for our artistically inclined followers. There are three memes: The first is based on Tyrion Lannister, the second on Hodor and the third, about how Elections Phases 2 to 7 are coming! The first phase of the 2019 Lok Sabha polls were held on Thursday with the next one due on April 18. The final phase is on May 19, following which counting will be held on May 23.